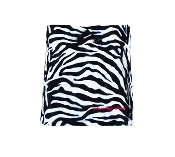 Soft, low pile faux zebra fur bag with matching black drawstring. Look stylish when arriving at the golf course by carrying your golf shoes in this bag. This drawstring bag can be used to carry golf shoes or to store shoes and other items in luggage. Great for separating lingerie or other small clothing items in your suitcase. Decorative hot pink "Fore Golf Divas" embroidered on lower right side of bag. Made in the USA. Machine washable. Dimensions 17" by 13-1/2". Optional waterproof liner available in fuchsia to complement the "Fore Golf Divas" embroidery or choose from lime, orange, or teal.